Bringing together the sharpest engineering minds, up-to-the-minute technologies, unbridled creativity and a mission to make the world a better and safer place, NAFFCO is a recognized international leader in the production of safety solutions. Founded in Dubai, the multinational company celebrates imagination and innovation at every stage of design, manufacture and implementation. Inspired by the company ethos- a Passion to Protect – and a completely unique approach to crafting superior services, NAFFCO creates and supplies a wide range of top-quality products and customized solutions to a host of prestigious international clients. This commitment to creativity and imagination has lead to NAFFCO’s dominance in protecting many of the most amazing feats of human engineering and iconic international design of recent years. The company’s products have been used in every imaginable construction – from architectural marvels like the incredible Yas Island in Abu Dhabi and Burj Khalifa and Palm Jumeirah in Dubai, infrastructural successes such as the Dubai Metro and Dubai World Central Airport, to shopping malls, hotels, business towers, sports stadiums and other structures in the UAE and beyond. NAFFCO aims to be the world’s No. 1 provider of innovative solutions that guarantee the best protection of life, environments and property. to secure their assets through the delivery of top-quality fire protection solutions. NAFFCO combines the sharpest creativity with the best technology and constantly strive to improve and develop in order to meet and exceed customer requirements. In addition to adding value for clients, the company is also continuously improving the effectiveness of its quality management system and setting the highest standards of international best practice. Advanced manufacturing facility fully equipped with latest technology and state-of-the art machines. Exporting to over 100 countries worldwide, NAFFCO’s clients include internationally renowned names in the hospitality and leisure industries, healthcare and education, global residential, commercial, infrastructural and aviation powerhouses, and governmental bodies such as military, police and emergency services. This incredible level of success and productivity relies on the most creative and outside-the-box thinkers and designers- NAFFCO’s team of more than 450 of the world’s most passionate and talented engineers, dedicated to producing the highest quality solutions that exceed client expectation. Globally, over three million square-feet of manufacturing space, as well as access to the best resources, allows these innovators to channel their expertise and imagination into the development of the most effective safety solutions. Clients can access multiple safety products, training and technology when they rely on NAFFCO’s comprehensive and convenient one-stop shop for all possible requirements. NAFFCO’s products include heavy duty vehicles and machinery, portable safety equipment and software installations fundamental to the preservation of life, environment and property. All required firefighting equipment and accessories, vehicles and rapid intervention units, hydraulic access and aerial platforms, custom-built appliances, airport rescue firefighting vehicles (ARFF), and mobile hospitals and ambulances support the company’s range of high quality products. The vast range also includes all elements of safety necessities such as fire doors, smoke curtains, fire walls and alarms, smoke and gas detection systems, emergency lighting, voice evacuation systems, and industrial safety equipment. Comprehensive training courses in fire fighting and emergency medical care are also provided. All NAFFCO products are certified to the highest international standards including ISO 9001:2008 quality management systems, certification for ISO 14001 environmental management systems and BS OHSAS 18001 for occupational safety by UL DQS. 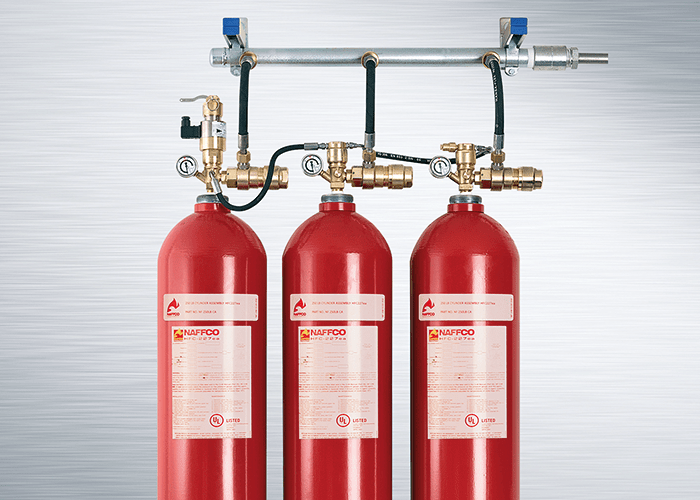 NAFFCO Inert fire suppression system: four gases, one system, all UL listed. Among NAFFCO’s complement of awards garnered over the past decade is the hugely prestigious Mohammad Bin Rashid Al Maktoum Business MRM Award for Excellence in Manufacturing. Presented by the ruler of Dubai, His Highness Sheikh Mohammed Bin Rashid Al Maktoum, this is a significant endorsement of the company’s commitment to deliver the highest standards in manufacturing. NAFFCO has also been honored with the MRM award for its Export Performance – further testimony to the extraordinary efforts made and standards reached by the company. NAFFCO has become an integral exhibitor at leading international trade events. Taking place at the Trade Centre Arena, Dubai from January 17-19, Intersec 2016 is the world’s leading annual trade fair for Fire, Safety and Security. As one of the most popular event exhibitors of recent years, NAFFCO’s expert team will be there to exhibit the latest, cutting-edge innovations and products to an international audience of key decision makers and top industry personnel.